Security labels can be used in a wide range of different situations, such as anti-theft and anti-counterfeit labels, genuine product seals and for asset protection. Police forces also use them to secure evidence bags and forensic samples to protect against tampering. With business wanting to ensure that their equipment is protected at all times, security labels are now being used more frequently to ensure that these are not stolen or tampered with. Two of the ones most frequently used are Void labels and Tamper Evident seals. With the void label, these are designed to leave the word VOID on the product if the label is tampered with or an attempt is made to remove it from the equipment. This clearly indicates that the equipment has been tampered with, or it has been mistreated in some way. Although computer equipment prices have fallen in relative terms over the last few years, this and other technical equipment is still a valuable asset to an individual or company. Another important aspect of high tech equipment is that many of these are on contract and this can include maintenance and servicing. Obviously if the equipment has been interfered with or an attempt has been made to open it, this can almost certainly jeopardise the agreement and could mean a cost is imposed. Also in the case of equipment warranties, these would almost certainly become null and void if the item is interfered with by a third party. Theft in the retail industry cost billions of pounds and ultimately it matters to us all. The retailer is not just going to shrug his shoulders as though nothing has happened and stand the loss out of the profits, no it means that all of us who shop must bear the cost of this theft by increased charges. We are all security conscious when it comes to our own personal property and the same can be said for important business property, it is after all a company asset and the location of the asset has to be known. It has been know for assets to “disappear” or it may be that they gave been misplaced or even stole. For this reason companies now using security labels to keep a check on their assets. Using security systems on your valuable items such as tablets and computers is essential if a company is to keep track of them and ensure that they as thief proof as possible. Over the years there have been many methods of adding security markings to valuable item, amongst the first was writing a postcode or company name onto the item which could only be read with the aid of infrared light, but it was possible to overcome this and it soon fell out of favour. 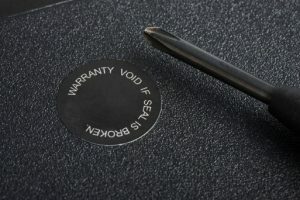 For security purposes and to ensure that a product has not been tampered with or unauthorised inspection of the item, tamper proof labels is one way to ensure this, as well as being a reliable way to prevent a label being transferred from one product to another in an attempt to gain a financial advantage, or theft. We can offer a choice of two types of security label dependent upon your particular requirements. For warranty as well as label transfer we are able to supply you with a label, which when an attempt is made to remove it the word VOID appears. This makes it clearly apparent that an attempt has been made to remove the label. Normally these labels would be of durable polyester that allows a variety of printing methods to be utilised, including barcode printing and full colour digital printing. The second kind of tamper proof security label is the destructible vinyl sticker, this simply breaks should its removal be attempted. With this material any attempt to remove the label will result in this label breaking into small pieces, much like flakes of paint. A very popular label with our customers and again this can be custom printed to you particular requirement with barcodes, sequential numbering, or even logos against a white background.